Hyper Zone is really fun. I’d never played Hyper Zone before today, which is surprising given it was developed by Nintendo-subsidiary and Kirby-creator HAL Laboratory. But it makes sense why this game has been forgotten, as it’s not groundbreaking in the way you’d want a second-party game to be. It’s a behind-the-back two-button shooter, highly reminiscent of Sega’s Space Harrier. This rail shooter gameplay has been done before. 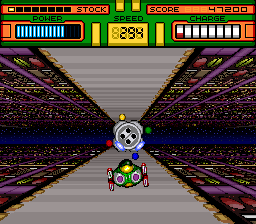 The one striking aspect of Hyper Zone are the graphics. It uses the Super Nintendo’s trademark Mode 7 background scaling to really give a three-dimensional impression. But even this isn’t enough to make the game stand out, because it looks almost exactly like Nintendo’s own F-Zero, released just a few weeks earlier. Not just because of the Mode 7; the “track” you’re flying over looks like it could be taken straight from F-Zero. There are even F-Zero style healing strips that restore your shields when flown over. But Hyper Zone fun. Every few levels, the number of which depends on how many points you score, you get a new ship which features slightly different abilities. It doesn’t make up for the fact there’s no power-up system in the game, but it changes things up enough. It also rewards skillful, high-point play by granting more powerful ships earlier to better players. This adds an interesting wrinkle to a game with such an arcade-minded mindset. There’s no story, no ending, and no end to blasting bad guys. Also, one of Hyper Zone‘s bosses is half of a Super Nintendo controller. That’s pretty cool, right? Tomorrow: There are more things to shoot in Super R-Type, except two-dimensionally this time. Notice the backgrounds are all tetrominos?